What is with those Croatians, they win each and every big Real TV contest. Amber, Bill... who's next? 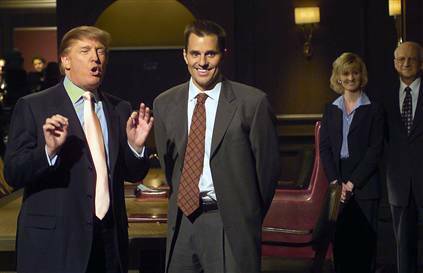 Donald Trump with "Apprentice" winner (and new Trump employee) Bill Rancic. Updated: 4:29 p.m. ET April 28, 2004NEW YORK - For one night at least, Donald Trump can really proclaim that he was the king of television. An estimated 27.6 million viewers tuned in Thursday to watch Trump say, âYouâre hired!â? to Chicagoan Bill Rancic on NBCâs hit boardroom game, âThe Apprentice.â? That enabled Trump to knock off televisionâs most popular show, âCSI: Crime Scene Investigation.â? The CBS drama was seen by 23.6 million, about 2Â˝ million fewer than average, Nielsen said. When Rancic won, Trump gave him a choice of two plum jobs: managing a Trump-owned golf course in California or overseeing a 90-story building project in Chicago. âIn a way, Iâm very happy he didnât choose the golf course, âcause I put someone there about a month and a half ago, and theyâre doing a great job,â? Trump said after the broadcast. âIt could have been a little bit embarrassing.â? The snag was averted. Rancic was happily homebound and his fellow finalist, Kwame Jackson, was fired as the hit NBC series aired its live finale. âKwame, I think you have an amazing future,â? Trump said. âYouâre a brilliant guy, great education, and I have no doubt youâre going to be a big success. But right now: Bill, youâre hired!â? Rancic, a street-smart 32-year-old Internet entrepreneur, had edged out Jackson, the laid-back 29-year-old New Yorker and Harvard MBA, for what Trump described as the âdream job of a lifetimeâ? and a $250,000 yearâs salary. Trump insisted the decision had been difficult, and close â and one he shared with no one before airtime â not even Mark Burnett, creator of âThe Apprentice.â? âI had good feelings about both of these people,â? Trump said after the show, âor they wouldnât have gotten there.â? Which did Burnett think Trump would pick? âI didnât think,â? Burnett answered flatly. The victorious Rancic said his win sends a message. âThe American Dream is still alive out there, and hard work will get you there,â? he told reporters. âYou donât necessarily need to have an Ivy League education or to have millions of dollars startup money. It can be done with an idea, hard work and determination.â? Then, asked when his job with Trump would start, he grinned and said, âI believe I am on the clock, even as we speak.â? Trumpâs decision closed out a three-month-long competition. The billionaire developer and host of the show put 16 would-be apprentices through numerous business tasks â then, in the boardroom, âfiredâ? an underperformer at the end of each episode. At their last assignments, Bill was put in charge of a Trump golf tournament and Kwame handled an appearance by pop star Jessica Simpson at one of Trumpâs Atlantic City casino hotels. These two âbossesâ? were each teamed with three âemployeesâ? : previously fired âApprenticeâ? candidates who, possibly still nursing grudges, sometimes seemed as much a hindrance as a help.Thanks to Billâs team, a vital sponsorâs sign went missing. Thanks to Kwameâs team, Simpson went missing. Then she disappeared again, while Trump tapped his foot. That was the handiwork of beautiful but scheming Omarosa Manigault-Stallworth, one of the breakout stars among the showâs candidates. Her feigned martyrdom after plaster fell on her head on one episode earned her the ultimate pop-culture salute: She was spoofed on âSaturday Night Live.â? Of course, not every burning issue was cleared up Thursday. For instance, how can 15 people be fired when they were never hired in the first place? That question may never be resolved. But the boardroom summits with Trump, where he pronounced the now famous âyouâre fired,â? helped make âThe Apprenticeâ? a sensation after its January premiere. Last week, it ranked second among all prime-time shows, logging 22 million viewers â even more than CBSâ âSurvivor: All-Stars.â? It holds seventh place for the season to date, according to Nielsen. Created by Burnett, who brought âSurvivorâ? to the airwaves, âThe Apprenticeâ? traded on a similar survival-of-the-fittest gimmick, and viewers loved it for its display of competitive greed and back stabbing. Another draw, perhaps: the eight female contestants were attractive and tended to wear short skirts. âThe Apprenticeâ? launched Trump to new heights of renown. Not only did he dine out on the catchphrase âyouâre firedâ? (even threatening to copyright it), he landed deals for a Trump-brand credit card and as a celebrity spokesman for a telecommunications company. Two weeks ago he was guest host on âSaturday Night Live,â? and now has agreed to come back for a new edition of âThe Apprenticeâ? next season, reportedly at a substantial pay raise. Looks like there are lots more firings ahead. ÂŠ 2004 The Associated Press. All rights reserved. This material may not be published, broadcast, rewritten or redistributed.